Retains Nathaniel\'s original, Lore-friendly look with less severity, slightly softened, without making him bishie. The difference is subtle but effective. Now with two degrees of softening! Now with two degrees of change! Mild changes: Makes skintone a little warmer, eyes a little larger, face a little less severe. Stronger changes: Skin a little warmer again, edges softened, face less 'scowling'. 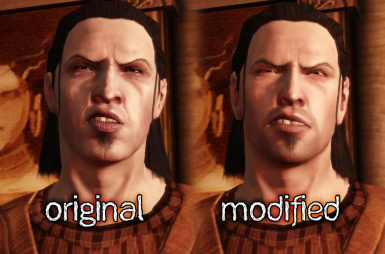 To install, copy file into ...\Documents\BioWare\Dragon Age\packages\core\override or a subfolder of same. 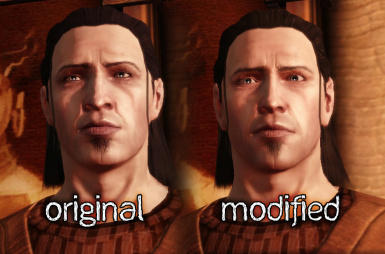 I personally use PineappleTree's default replacement eyes, but you should not need them for this mod (they just make his eyes lighter).